A Las Vegas police officer was caught on camera using a stun gun seven times as well as an unapproved choke hold to “subdue” an unarmed black man who later died after a foot chase through a casino. According to CBS News, Police Officer Kenneth Lopera thought the man—identified as Tashii S. Brown—was trying to carjack a pickup truck with two people inside when he fired the stun gun in a series of bursts and used the unapproved choke hold early Sunday morning at the Venetian Las Vegas resort and casino, Clark County Undersheriff Kevin McMahill said. At a press conference Wednesday, McMahill showed video from Lopera’s body camera as well as security footage from the Venetian. Officers have said that Brown—who also goes by the name Tashii Farmer—was sweating and looked panicked as he told police that people were chasing him. In the video, you could see Lopera and Brown encountering each other before Brown suddenly took off running. The chase picked up through an employee-only area of the hotel and a stairwell before Lopera eventually caught up with Brown outside the hotel. According to the Las Vegas Metropolitan Police Department, Lopera, who is white, said on the bodycam footage that Brown appeared to be attempting to open the tailgate of an occupied truck driving in the area. Brown then allegedly ran around to the driver’s side of the truck and attempted to open the door. Lopera, apparently thinking that Brown was attempting to carjack the driver, grabbed his Taser and yelled to Brown that he was going to tase him. Lopera deployed the weapon and Brown went to the ground. “Don’t move! Get on your stomach!” Lopera shouted. “I will!” Brown was heard responding. Brown could be seen on his back with his arms raised before another jolt of electricity hit him. “Please! Please!” Brown cried out. In all, Lopera tased Brown seven times. Lopera and Brown then scuffled as the officer attempted to handcuff Brown. The officer punched Brown in the head and neck as Venetian security guards joined the effort and other officers arrived. 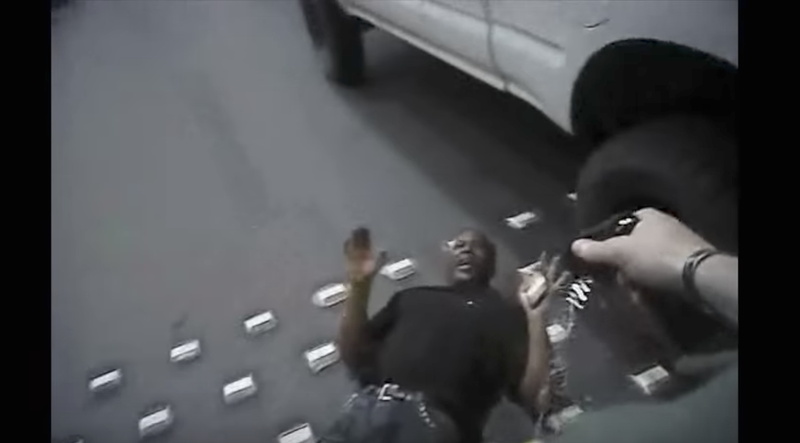 McMahill acknowledged that Lopera applied the choke hold for over one minute—far longer than the seven to 10 seconds that it may take for an approved carotid restraint to render a person unconscious—before releasing his grip as additional officers arrived on the scene to assist in restraining Brown, according to CBS News. According Las Vegas Now, as soon as officers realized that Brown was not breathing, they started CPR chest compressions. Brown was taken to Sunrise Hospital, where he was pronounced dead at 1:29 a.m.
McMahill also noted that the driver of the pickup did not believe that Brown was trying to carjack his vehicle and that Brown was not believed to have committed any crime. So why is Tashii Brown dead? When will this end? When will officers be properly trained to de-escalate a situation? McMahill noted that Brown’s apparent appearance—heavy sweating, appearing panicked, etc.—showed signs of “excited delirium,” according to the New York Times. Where have we seen that before? “Excited delirium” was listed as Natasha McKenna’s cause of death ... when she was completely restrained in a chair and shocked with four 50,000-volt hits from a Taser. The 5-foot-3-inch, 130-pound McKenna later went into cardiac arrest and died at the hospital several days later after being removed from life support. When Will We Demand Justice for Natasha McKenna? There have been no marches for her. Brown, however, did not even make it through being apprehended. Lopera, 31, has been on the Las Vegas force for five years. Of course, since the incident, he has been put on paid leave pending departmental and district attorney reviews of the incident. I’m not sure what needs to be reviewed, but I guess that’s also why I’m not a police officer. According to CBS News, Sheriff Joe Lombardo told the Associated Press that there was no indication that race played a role in the incident. I’m looking forward to seeing exactly what they say did play a role in it. “He was very fearful. He didn’t run away at his fastest pace. He looked confused,” Lagomarsino said. According to the report, Brown grew up in Hawaii and was the father of two children. He lived with his mother in Las Vegas, where he had a business selling shoes, hat and clothes. Lombardo is asking for patience from the public as the incident is investigated. Clark County, Nev., District Attorney Steve Wolfson said that there will be a public use-of-force review to air the findings of investigations into Brown’s death, CBS News notes. “We’ll be fully transparent and we will look at this event with a very critical eye,” Lombardo said. As for Brown’s mother, Trinita Farmer, she doesn’t want to see the video of the incident that left her without her son.